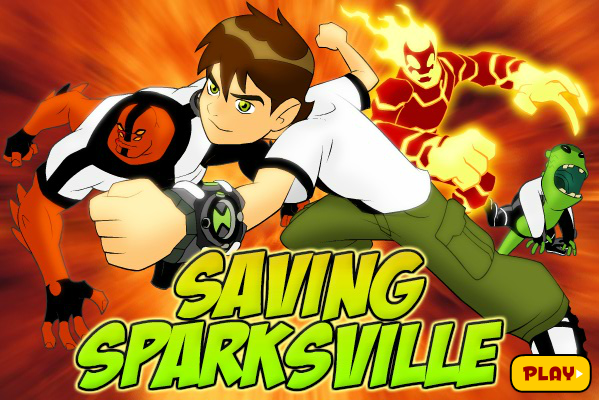 Ben 10 is once again on a mission to save the world from harm and this time he is fighting against the Megawatt in Ben 10 Saving Sparksville Game. Are you excited about it? So let’s not waste time and read about the game further in detail. In Ben 10 Saving Sparksville game, Ben 10 is fighting against the big giant robot Megawatt. The Robot is on a run towards the hydroelectric dam to power up. Recommended: Play Ben 10 Fighting Games online for now! Your Misson in the game is to kill the Megawatt Robot before it reaches to the dam. To complete this mission, Ben 10 transformed into Heatblast and he is flying on a board to hit the Megawatt Robot with the Fireballs. To Perform well in the game lets read about the gameplay Further. During the GamePlay, your only target will be to hit the Megawatt Robot and stop him to reach to the Hydro Dam. He has already taken over the town’s planetarium exhibit and brought it to life. Megawatt will continuously throw cars towards you, but you have to save yourself from the flying cars and at the same time hit the weak arms of Megawatt with your Fireballs. Pro Tip: Hit the Weak Arms of the Megawatt and save yourself from the flying Cars! You will see a Red Circular Target whenever you fly near to the Megawatt, this will be your hitting target to damage the weak arm of Megawatt Robot. It’s in your hands to save the Town, Get ready to fight against the Evil Megawatt Now! Don’t Forget to give your rating for Ben 10 Saving Sparksville game and share your tips and tricks to win this game in the comments section below.